The palaces built in Rome in the seventeenth and eighteenth centuries are some of the most magnificent buildings in Europe - yet they remain relatively unfamiliar. This is the first stand-alone overview guide ever published. 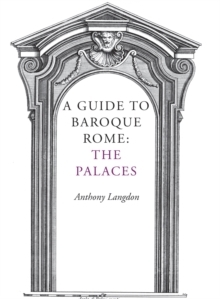 We are producing it as a companion volume to our revised edition of Anthony Blunt's seminal guide to Baroque Rome (A Guide to Baroque Rome: The Churches, 9781873429181). In this volume, Anthony Langdon draws on an encyclopaedic knowledge of the hugely productive scholarship in the field, which he distils with elegance, acumen and wit. Over the last thirty years all aspects of the design, construction, decoration and functions of these great houses have been examined and our understanding of the period has been transformed. Scholars and visitors alike will find this volume a stimulating, concise and eminently readable companion. The rich illustrations include over 140 contemporary prints, as well as plans, elevations, and specially taken photographs. Full references and indexes make this an indispensable aid to all further research.